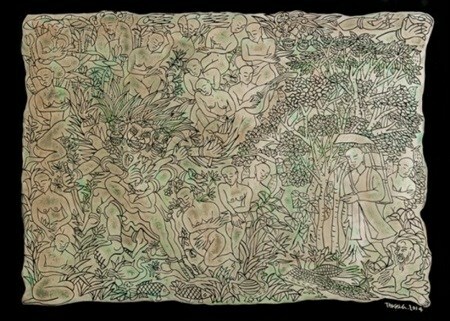 Hanoi (VNA) - Seventeen artworks were sold for a total 18,000 USD at an auction held at the Vietnam National Museum of Fine Arts. They are among more than 61 artworks donated by artists to raise funds for rebuilding Nha Lang (The mansion of hereditary mandarin of ethnic Muong) in the northern province of Hoa Binh. The ancient house is owned by Vu Duc Hieu, Director of the private Muong Cultural Museum. It was ruined by a careless group of tourists by the end of 2013. Hieu launched a campaign to rebuild the house through a series of fundraising activities such as exhibitions, fashion shows and art auctions. Nearly 520 million VND have been raised so far. The organisers wish to receive continuous donations, which can be sent via Vietcombank's e-banking system and to 198 Tran Quang Khai, Hanoi, to the account name of Vu Duc Hieu, and account number 0011004237191, with the swift code being BFTVVNVX.